On Thursday, Nov. 15, between 7 p.m. and 9 p.m., Laurier’s campus club International Students Overcoming War (ISOW) hosted a Middle Eastern Cultural Evening event to get students participating in and celebrating the various cultures of the Middle East. Some of the events of the evening included henna and Arabic writing stations, a photo gallery, singers, dancers and complimentary food prepared by members of ISOW. “There was a youth group that came and participated, there was a Dabkeh group, the Levant [that came and performed] ... We had [an] art activity where there was painted rocks and we were able to spell our names and words that we wanted to know how to spell in Arabic,” said Paula Belliveau, director of events and education for ISOW. Dabkeh is an Arab folk dance native to the Levant — a geographical term associated with the Eastern Mediterranean area, including Israel, Iraq, Jordan, Lebanon, Palestine, Syria and Turkey — that combines circle dance and line dancing. Among the food offered at the event included a varied assortment of Eastern Mediterranean and Middle Eastern cultural dishes: Makloubah, Frikeh, Fatoush, Falafel, Hark Osboa, Lahm B Ajeen, Baba Ghnoush, Fatteh, Lentil Soup and Tabouleh. 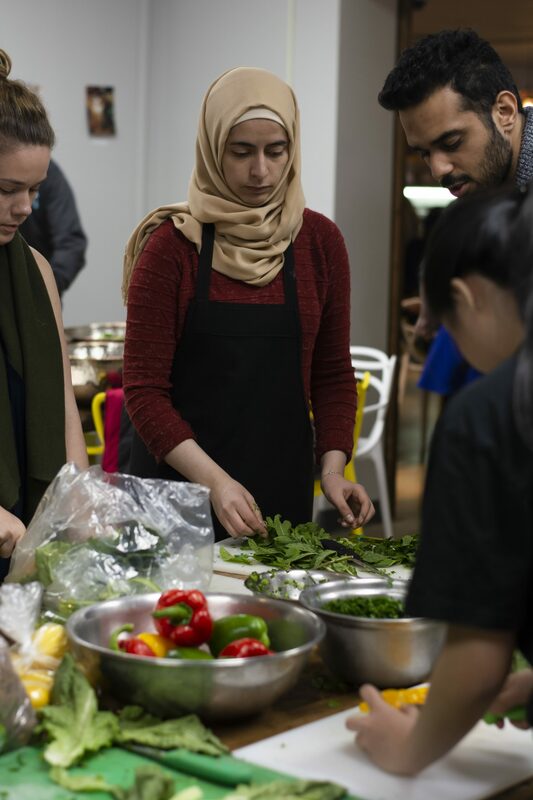 “Just before [the event] there was a cooking class in Veritas for the graduate students — and we were able to lead that as a Middle Eastern cultural cooking class. So we prepared [the food] there,” Belliveau said. One of the main reasons for Thursday’s event was to educate the general Laurier community — it was free and open to the entire student body — on a few of the different and less focalized cultures in the east. “It was a chance for the students to showcase their Middle Eastern culture, what they grew up with, and share it with the community,” Belliveau said. ISOW as an organization began in 2013. By 2015, they were able to get a referendum on student tuition to support the furthering of education for Middle Eastern students. Each semester, Laurier students pay a few extra dollars on their tuition levied towards complete, funded scholarships for these incoming students. “It helps to sponsor students from the Middle East in attending Laurier; so it covers their tuition, their lodging and the emergency funds that they need [to flourish],” Belliveau said. As far as planned upcoming events, ISOW will be hosting an MP luncheon sometime by the end of the semester. The details, as of yet, have not been finalized and are still in the planning stages.